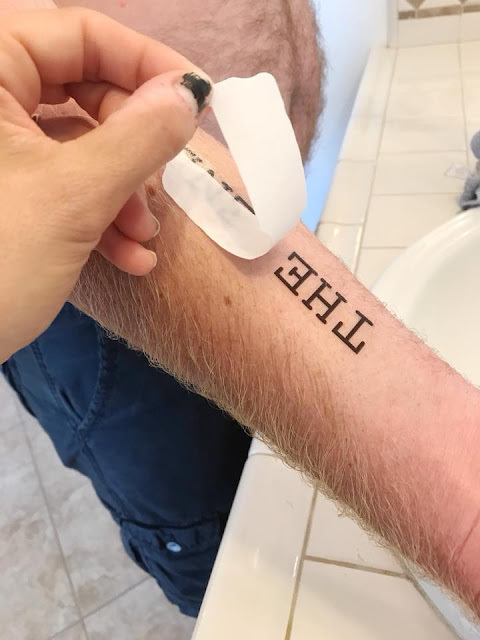 Tattoos have been the talk between my husband and I lately. 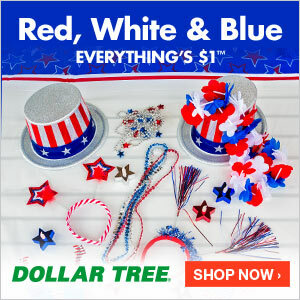 Neither of us have one yet and both of us have been tossing around the idea of getting one. I know...I know...I've heard they are super addictive. I am also well aware that it's a PERMANENT thing to get one done. So making sure you get something of meaning (that will be a positive meaning your whole life) is SO SUPER IMPORTANT to us both! 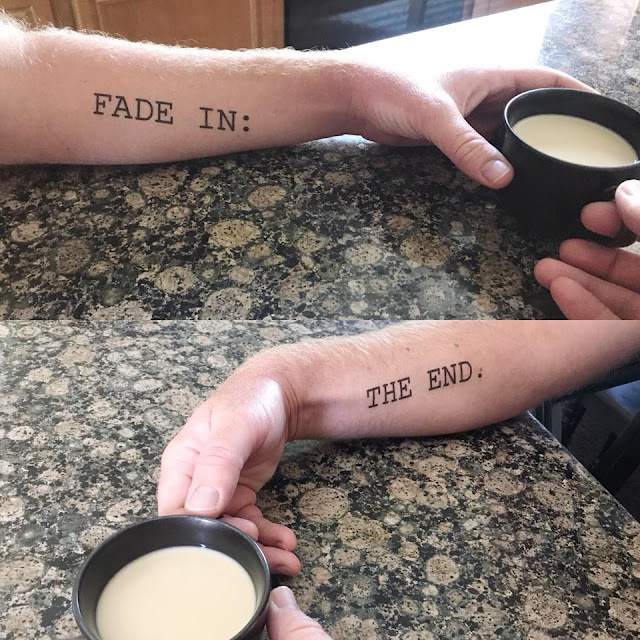 We found a company that makes MOMENTARY INK for you to try out before you commit to the permanence of a tattoo. 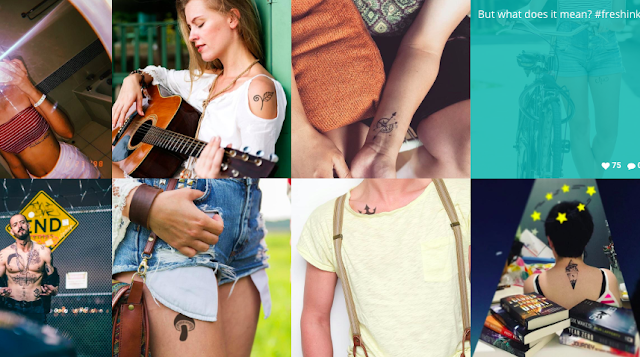 Their tattoos can also be CUSTOM CREATED (which is exactly what we were looking for) to temporarily try out for placement and look. 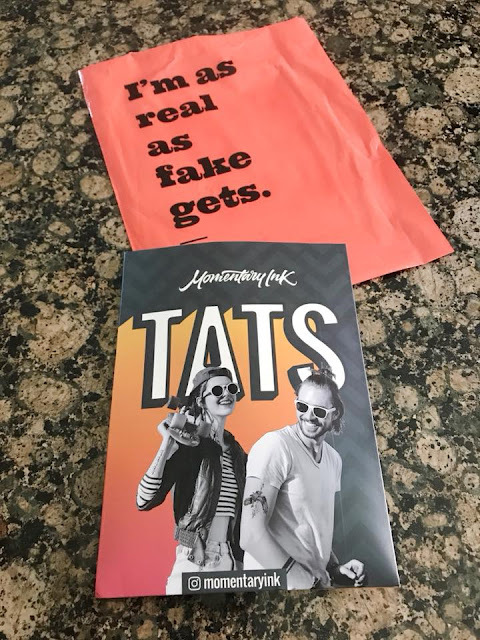 We were delighted when my husband's tattoos arrived, just as we had requested (and the exact size & look he's been wanting). The font is important to him, because he's a writer and it's the exact font they use in their scripts. 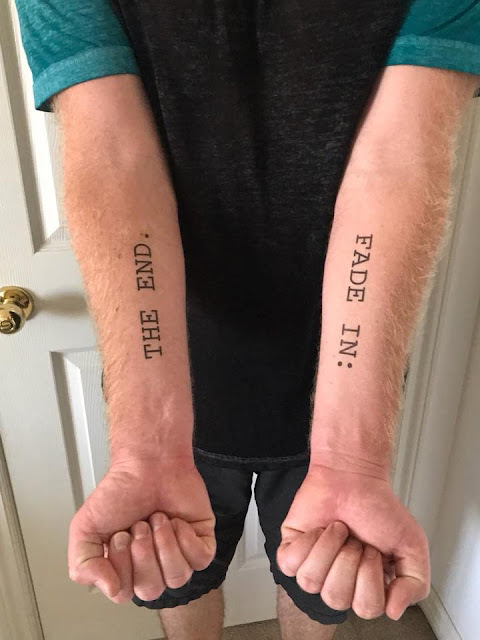 He wanted the one on his left inside forearm to read FADE IN... (like the opening scene of a movie) and the right inside forearm to read THE END. (the last words on a movie script). 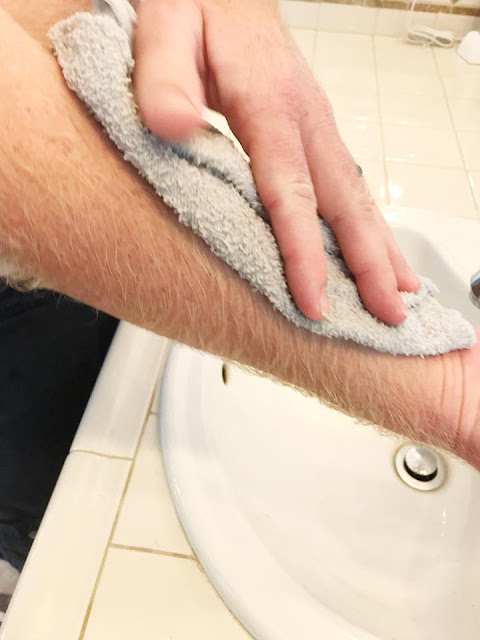 Because my husband is pretty hairy in general, we had to shave and clean his arms first. 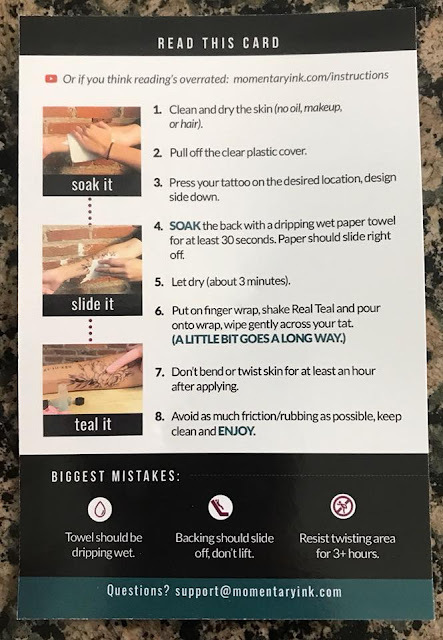 Then we peeled the plastic off the front, laid the tattoo on his arm in the perfect place and wet it with a very, VERY wet washcloth. They transferred to his arms so easy and already looked pretty LEGIT (HOTT)...but they looked even more REAL when we sealed the tattoos with the "REAL TEAL" that also came with the tattoos. 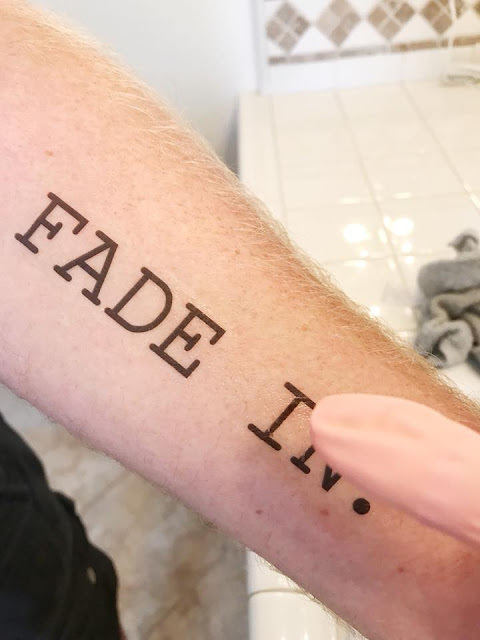 You spread a thin layer over the tattoo transfer and it seals it on your body and also mattes the look...so you can't tell that it's not a real tattoo. OH MY GOODNESS...I'm in LOVE! I can't wait for him to get the real deal...but for the next couple weeks, I'm going to enjoy the Momentary Ink Tattoos he'll be sporting. They also sent a tattoo for me to try out (which I know I would have loved), one that is a big seller on their site. 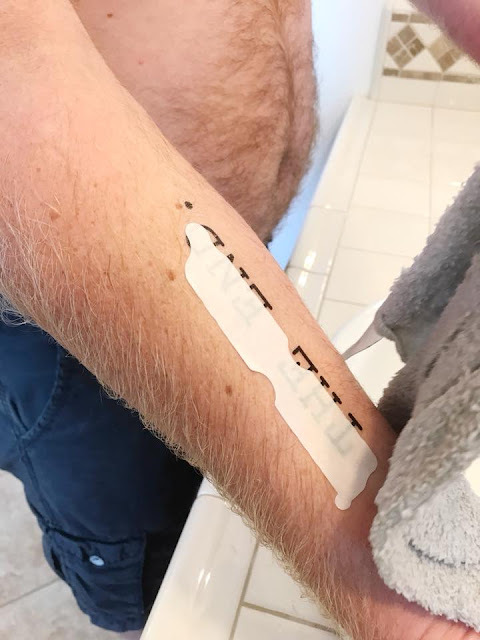 But sadly, the person assisting me (I will not name names) with placement and transfer of the Momentary Ink Tattoo, forgot to remove the plastic film and the tattoo transferred onto the plastic instead of my skin. I think they were a little excited about the idea of this tattoo and where it was going and they just got ahead of themselves. I was pretty bummed, especially since I'm not 100% sure what I want to get yet, and was hoping this would give me a better idea of where and what I wanted. So, I'm just going to have to order a couple more from their to try out myself, to see what I like best...before I commit to a permanent one. This Momentary Ink company is BRILLIANT! I love that their tattoos are temporary, but still longer lasting than a normal temp tattoo. The REAL TEAL product really does help prolong the life & the look of this Momentary Ink. 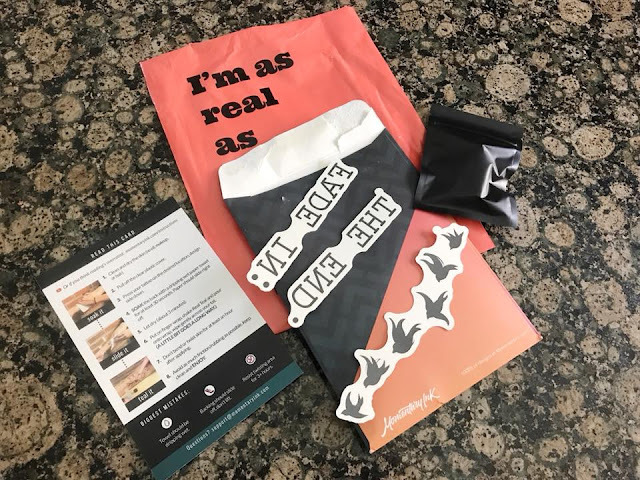 CLICK HERE to see their HUGE selection of already created tattoos or send in your custom idea and have them ship you out one to try out first...to make sure it's exactly what you want before you get inked for real.